FAQ’s « Interstate Creative Design Corp.
Like our facebook page to stay updated on our projects. What are the health benefits to interior polished concrete? If you're looking for allergy relief, removing your wall-to-wall carpeting and opting for decorative concrete flooring can help. When it comes to allergies, carpeting can be one of the biggest contributors to your suffering because it's difficult to keep clean and often becomes a haven for dust mites, pollen and other allergens. Concrete floors can ease your sneezing and congestion because they don't trap allergens and they are easy to clean. What's more, synthetic carpets can also emit harmful VOCs, as can some of the products that accompany carpet installation such as adhesives and padding. Exposure to toxic mold in homes and buildings has been blamed for ailments ranging from headaches to severe respiratory infections and immune system disorders. Mold can thrive on any organic material, especially in warm, moist, humid conditions. Unlike wood and other organic materials, concrete won't support the growth of mold, mildew and other hungry microorganisms. See Why Concrete Is a Healthy Alternative. To improve the quality of the air inside your home, treat your interior masonry walls. Treating your brick, mortar or concrete walls will slow down deterioration and reduce dust. When brick and masonry deteriorate, it produces dust which is blown into the air, then inhaled. Walls can easily be treated to create a cleaner environment. You will notice less dusting. Surfaces are protected from stains and moisture. Lets face it, regular concrete gets dirty. Because the concrete is exposed and porous, it will absorb anything in its capillaries and pits. Dirt, leaves, moss, mildew, pollen, paint, rubber, etc...are types of debris found on concrete, that are sometimes difficult to remove with a brush or detergent. This article will cover the proper way to pressure wash and clean concrete, cement, and masonry. This process is green due to the fact that it only requires water and baking soda. -Box of baking soda per 500 square feet. Step 1: Start by wearing safety glasses and prepare to get wet. Use the 15 degree tip to pressure wash the heavy debris. Just move quickly to remove loose material and soak the concrete. Step 2: Mix 1 box of baking soda into five gallon bucket of water. Mix to dissolve the baking soda. Use the chemical attachment on the pressure washer, to spray the solution over the concrete and masonry. Be sure to change tip to a chemical tip. Step 3: After solution is spread, change the tip into the 5 degree tip and start deep clean pressure wash. Be sure not to remove too much of the concrete surface. Be sure to clean out expansion joints and cracks. A good acrylic sealant is recommended to seal the surface from future stains. Check out my other articles. Send questions. Be sure to practice safety. Muriatic acid can be used Start from the highest to lowest points Be careful not to remove too much concrete surface. Pressure washer can strip paint off houses. Concrete walkways are durable and inviting. Though they are dependable, they are often neglected. When concrete is not sealed, it adsorbs everything in its environment. Leaves, pollen, dirt, and moss are common issues seen on concrete walkways. Without proper maintenance, these can permanently stain. Concrete can be cleaned via mechanical method and/or chemical method. This article will combine both method to clean a concrete walkway like a professional, the right way. These methods pertains to regular, unsealed concrete. This method SHOULD NOT be used for decorative or stamped concrete. For instructions on cleaning stamped or decorative concrete, look up my other articles. Step 1: Start by pressure washing. Keep the tip close enough to remove and penetrate into the concrete. Do not keep it too close as to remove the concrete finish. Any thing on the surface should blow off with the pressure. Step 2: Measure 1/2 gallon of muriatic acid and pure into a five gallon bucket. Carefully fill the bucket with water. Use rubber gloves and eye protection for precaution. This is a 10:1 mix. Use the same ratio if larger or smaller mixes are needed. Step 3: Use a broom to spread and scrub concrete with the acid mix. Initially, the acid will cause the concrete to fizz. Let it sit for 10 minutes. If there are any stains, use a more concentrated mix. Don't let the area sit for it will discolor. Wash it all off with a hose. Step 4: Pour 1 gallon of ammonia into a five gallon bucket. Fill the rest with water. With a broom, pour and spread the ammonia mix over the entire deck. Let it sit for 10 minutes and rinse with a hose. Step 5: Finally, scrub the concrete walkway with some soap water and a broom. Use plenty of soap in order to penetrate into the crevasses. After it dries, it is recommended to seal the walkway. Sealing should take place only when the deck is clean and dry. Use grinder or wire brush to remove deep stains. Keep your concrete walkway happy,.. seal it. Use bleach for dark moss. Do not come too close to the concrete with the pressure washer. Use caution when working with acid. * Tile and brick are available,they come in different patterns, sizes and styles. *Take it one step at a time. * See what available with local contractors. Different mats have authentic texture. By looking and feeling the rubber mat, one is able to get an idea as to what texture to choose. Ask your contractor for a sample in order to get an idea as to what to expect. -	These are the simple categories to base your decision on. Concrete looks authentic in all its patterns and textures. -	When choosing color, Just ask yourself "What looks good here?" -Take a look around the area and keep the general color of the environment. -	Choose a color scheme if you want to change the whole look. There are color palettes available to include walls, fences etc. -	ex. If there is a stone wall next to the concrete patio, choose between the accent colors of the stone. This will keep your new decorative concrete from blending into the background, unless desired. -	It's all about placement because concrete looks good in any professionally stamped finish. -	When you have come up with these basics, talk to different contractors. Obtain their options and opinions with your preferences. There are simple steps you can take to express yourself through the life of the concrete. With the many different looks one can achieve, all concrete finishes are personal and unique. -	The more pictures one sees, the more ideas one can create. -	Make the process fun and exciting and your concrete will make you feel good every time you use it. When homeowners look to create more living space in their homes, basements are the place to do just that. A common problem is the old concrete floor. A common solution is to quickly cover the dirty floor with a rug or paint.Those two choices should be your last resort. With the many products and solutions, your concrete can look like tile, stone, brick even a marble slab. All at a fraction of the cost. Durable overlays and acid stain make this possible. This article will cover ways to diagnose your concrete to determine the right solution. If there is a rug or paint on the floor, it would all have to be removed. Removal must include oils, detergents, glues, cement and mastic. The concrete must be clean and absorbent. This step is the messiest but the most critical. A diamond wheel is used to remove all impurities and to smooth out the whole floor. - Most of the cost goes into preparing the floor. First you would like a visual determination. Look around to see if there are any large crack (about 1/4 inch wide or more). These would have to be filled and leveled off with bonding epoxy and silica sand. Shifting between the slabs should be noticed. Scrape the concrete with the edge of a putty knife. If you can make a deep scrape, this is considered Soft concrete. If the knife slide and only scratches the surface, this is considered hard or burnt concrete. With a wet paper towel, dab the concrete to determine how absorbent it is. If the water evaporate fast (with in 1 min. ), its not too porous. If the concrete absorbs the moisture an remains damp, the concrete it absorbent. Feel the concrete. By rubbing your hand on it, you can determine if the concrete is smooth or pitted. If you are able to see small stones coming through, this is called aggregate. Read tips below for solutions. Compare condition of concrete to possible solutions. Take an overall look at the floor. Notice any staining or rough areas due to the polishing. Use Chart for the conclusion. After you have diagnosed the concrete, you can call a contractor and come up with a game plan. Ask for samples and references. Read tips below for solutions. Acid stain is a great way to add color and life to the concrete. Because acid stains in a random, marble, it is a great solution to hide any imperfections on the concrete or overlay. Many colors and patinas are available. -	Concrete should be sealed once every 3-5 years to keep a brand new look. -	Concrete overlays are the best solution and the most pricey. -	To remove and re-pour the concrete is never a solution. -	Rugs in basements are prone to mold and mildew. -	Epoxy and paint in basements usually peel off due to the humidity coming through the floor. What is decorative concrete overlay? Decorative concrete overlay is a polymer modified cementitious overlayment. I know that doesn't answer your question but it is a concrete like product that has polymers and proprietary additives added that enable this product to be overlaid or spread over other surfaces like wood, concrete, plaster, wallboard, cement-board, or urea foam. The additives, give the decorative concrete the ability to withstand high humidity and dampness, UV radiation, and freeze/thaw cycles without deteriorating. The product will mechanically bond and chemically bond with concrete. This assures that the product, once applied, will not delaminate. This product can be textured or smoothed to resemble any stone product like: marble, slate, flagstone, or field stones, in any color imaginable. Is there a difference between stamped decorative concrete and decorative concrete overlay? There is a difference, lets start with stamped decorative concrete, stamped decorative concrete is poured as a slab, like any white concrete. After the surface has set, it will be stamped by the contractor with special stamps that have the desired pattern molded into to them. The surface then is colored as desired by the customer. Sometimes the entire pour will be colored. Decorative concrete overlay is spread as a thin layer over concrete or other compatible surfaces and is then stamped or smoothed and colored or stained to give the customer the desired effect. Not necessarily, this product can regrade surfaces of 3 to 4 inches right to a feather edge. The cause of the heaving of the concrete base should be corrected first, particularly if it is caused by tree roots or a poor concrete installation. Where have decorative concrete flooring systems been installed? These flooring systems have been installed in: casinos, shopping malls, offices, hotel lobbies, retail stores, residential homes, and anywhere in place of conventional tile, terrazzo, quarry, etc. This product does exceptionally well in high wear areas. In many cases the answer is YES, if there are no structural issues that need to be corrected. This determination should be made by a Structural Engineer or Certified Concrete Contractor. Is indoor concrete flooring difficult to maintain? No, this flooring is no more difficult for the homeowner to maintain than a hardwood floor. It can be cleaned with any floor cleaning product like Mop and Glo. The floor can also have a wax finish applied if the homeowner wants. Overlays on wood surfaces are reinforced with metal lathe which is secured to the sub flooring with over 25 fasteners per square foot. This ensures that maintenance will be cosmetic, not structural. How resistant are decorative surfaces to stains and spills like oil or grease? Once the floor or any surface is sealed by the contractor, depending upon the type of sealant used, the surface can be impervious to many chemicals including: salt, petrochemicals, UV radiation, and water. This makes decorative concrete flooring an excellent choice for driveways and garage floors. If I happen to damage a decorative surface how difficult is it fix? Repairing decorative surfaces is easy; the only difficult part is matching the color. Damaging a decorative concrete overlay surface is tough because it can withstand 5,000 pounds per square inch of compressive strength. In many cases, the surface damage will be to the sealer and not to the polymer concrete. How long does it take to install a decorative concrete floor? The typical installation is 3 to 4 days. The floor is safe for heavy traffic by day 4. I have an older home and I wanted to have tiles installed, but the tile contractor said he would not do it because the floors were too springy. Could I still get a decorative concrete floor? Probably, yes, it would depend upon the condition of the sub flooring and the flooring joist. Decorative concrete has give to it where other stone or ceramic products would crack or fail completely. If you have floors that rattle when your family's cat runs by, then you should have the floors reinforced before installing any flooring product. I have a friend who had a tile floor installed in their kitchen, but now that floor is almost an inch higher that the rest of the floors in the house, will I have this problems with a decorative concrete floor? It depends on the sub-floor material. If you have a concrete floor, then the overlay can be as thin as 1/8". If you have a wooden floor, you will see an increase in floor height, how much depends upon the condition of the sub-floor. A typical installation may see an increase of 1/4" to 3/8". The other advantage is that any "valleys" you may have in your floors can be easily trowled out. If the floor needs to have a laun-plywood underlayment, then this could add another 1/4" to the final height of the finished floor. Do I have to rip up my old linoleum floor before having a decorative concrete flooring installed? Not normally. It depends upon how well the linoleum is adhered to the sub-flooring. If that is not a problem, then the decorative concrete floor can be installed right above the linoleum flooring. If height of the floor is a concern, then the linoleum will need to be removed. How long will my decorative concrete floor last? The indoor applications will last for decades with minimal cleaning and maintenance. I would like to use this product over my existing driveway, is there anything I need to be concerned when my driveway is plowed this winter? It depends upon the texture of the finish. If the finish is like a slate or stone with a smooth finish and not many raised areas, then there is nothing to be concerned about. If the finish is similar to a cobble stone or similar finish with high and low areas then the plow or snow blower may damage the raised areas. You also should tell the plow operator not to scrape the driveway clean, but to leave a thin layer of snow. The sunshine after the storm should finish the job and this reduces the risk of damage to your driveway. You should also use sand, not rock salt or any other product to melt the snow. What is the average lead time before I can get interior decorative concrete installed? The normal lead time is 2 weeks. This varies depending upon the time of year. In the summer months it could be up to 4 weeks, during the winter months it could be less than a week. 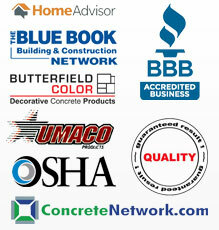 What type of warranty or guarantee comes with a decorative concrete surface? The product is guaranteed against defects in labor and material. The length of the guarantee depends upon where the product is installed. Is there any maintenance required that I can't do myself? Like the finish on a hardwood floor the protective sealant can be worn down in high traffic areas. In these instances, the decorative concrete surface should be resealed by a certified decorative concrete installer depending upon the type of sealant used. If a polyurethane sealant was used then a new coat of polyurethane could be applied. It is recommended that you check with the contractor or with the care guide given to you by the contractor. IDCD has a maintenance program that addresses this issue. Please visit that page or use this link Maintenance Program to learn more. Is there any limit to the size of the area that can be covered? Simple stated NO. It would depend upon the contractor's ability to perform the work. If the area in question is a large vertical surface, where special scaffolding would be required, then you need to contact a contractor who has done this type of architectural surfacing. What advantages are there of decorative concrete over something like pavers? Product Selection Usually most distributors only carry about a half dozen styles in stock and need to special order anything else. Shipping charges may also be added to the cost of the job. Only limited by the imagination. Find a finish you like and it usually can be simulated. Weed Resistance Weeds will grow in-between the pavers after the first season and will require the constant use of dangerous herbicides to remove. The decorative concrete surface is solid and continuous; weeds have no place to get a foothold and spread. Sink Holes Sink holes or depressions can form after just two seasons. This can be caused by frost heaves and the activities of animals and insects. This creates a dangerous tripping hazard. The only way to repair this is to lift the pavers replace the missing base material and replace the pavers. The decorative concrete surface is solid and continuous. It is resistant to freeze/thaw cycles and water runs off the surface. Dangerous formations of sink holes do not occur. Can decorative concrete be applied over counter tops? No, not over, but you can have a concrete countertop that can be made to look like almost any stone material. Depending upon the look the customer wants, the countertops can be made on site or in shop and installed. The reason for doing the countertops in shop is because of curing time and sanding of the surface. It is important for the concrete to cure before use. Some finishes may require grinding of the surface to expose the aggregate just below the surface and the dust needs to be contained. Is the surface of a concrete countertop safe for food preparation? Yes, there are sealants that have FDA approval, the only problem is that these sealants aren't as wear resistant as the sealants used for floors. It is not recommended to use a knife for cutting directly on a concrete counter top. Can Decorative Concrete be applied over an asphalt surface? No, this is the only surface that can't be coated. This has to do the expansion rate of asphalt and its ductility when it gets hot. The two materials are just not compatible. What happens if I don't like the color or I change my mind and want a different color? That depends where in the process you make this decision. Before we begin any job you will be give a "Process Sheet". This sheet shows you each of the steps involved. One of its benefits is it will show where changes can be made at little or no cost. In the case of color, if the decorative concrete surface has not been sealed then the color can be lightened or darkened. The color can also be bleached out if necessary depending upon the process being used. © 2019 Interstate Creative Design Corp.